LG G8 ThinQ smartphone uses its OLED screen to create audio | What Hi-Fi? The smartphone world’s biggest annual launch event, Mobile World Congress (MWC), is just over a week away, and we’re expecting some big flagship announcements from the likes of Sony, Huawei and LG. We’ve known for some time that LG will be using MWC 2019 to introduce the G8 ThinQ handset – the successor to its G7 ThinQ – but the Korean company hasn’t been shy in talking about its features ahead of the launch. 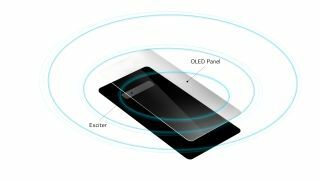 Arguably the most interesting of which, revealed today, is its Crystal Sound OLED (CSO) technology, which sees the LG G8 ThinQ’s OLED display working as an audio amplifier. Essentially, it repurposes the screen as a diaphragm, vibrating the entire surface to produce sound - a sound supposedly capable of impressive volume and improved clarity. It's a method Sony uses in its AF9 and AF8 OLED TVs. There’s also a speaker at the bottom of the phone that uses the internal space of the phone as a resonance chamber speaker in an effort to boost bass and volume. LG and its audio partner Meridian have also incorporated DTS:X 3D Surround Sound, which is designed to emulate a 7.1-channel soundstage through its speaker or your headphones. Unsurprisingly like its predecessor, the latest G Series handset will feature its Hi-Fi Quad DAC and support MQA audio. Presumably, aptX HD Bluetooth will also be onboard.